Edgar Culpin aged 17, at military camp in 1914. 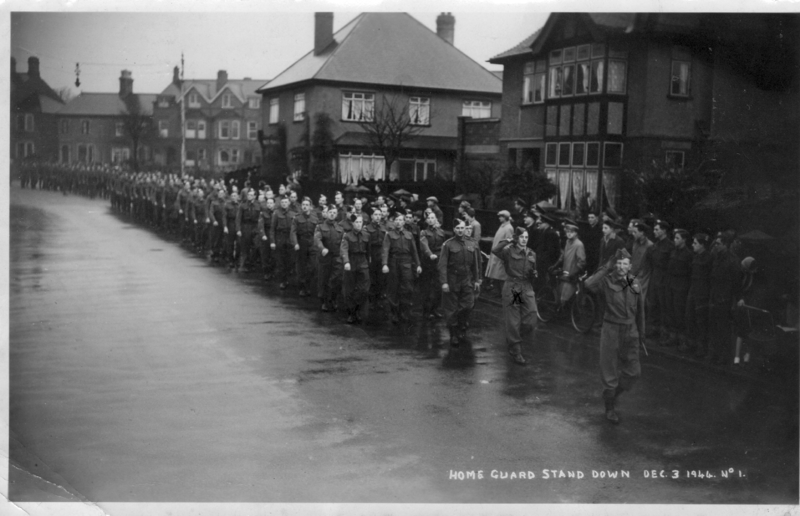 Edgar Culpin at the front of the Home Guard parade, immediately behind the leader, in Melton Mowbray in 1945. Edgar Culpin is the name of one of the men on the Bottesford ‘church list’ of WW1 Servicemen. Edgar Culpin was born in 1897, baptised on the 17th November, 1897, in Bottesford parish church, son of Richard Culpin (born 1872, in Ryhall, Lincolnshire), and Emily Culpin (born 1877 in Swinstead, Lincolnshire). Richard was a railway platelayer when, in 1901, he and Emily lived on what was then known as 10 Belvoir Road, nowadays Castle View Road, in Easthorpe, with their three children Elsie (4), Edgar (3) and Cecil (1). In 1911, the Culpins were at 10 Easthorpe Lane, which probably was the same house they had occupied then years before. Richard Culpin was still a platelayer, and Edgar (now 13) was employed as a bakery worker, and Cecil was at school. There were two additional children, Wilfred (7) and Maurice (4). Edgar Culpin joined the Leicestershire Regiment, where he successively had two service numbers. He was 3545 2/5th Battalion Leicestershires, then given a new number as 241248 Sergeant 1/4th Leicestershires which he kept when transferred to the 6th Leicestershires. He was awarded the Victory Medal and the British War Medal, and was mentioned in the London Gazette in 1919 on his award of the Military Medal for services in the field. 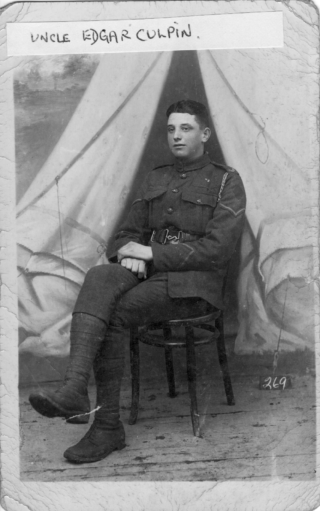 Edgar Culpin remained in the army after the armistice, and served in Ireland at the time of the Troubles. He left the army as a Company Sergeant Major. 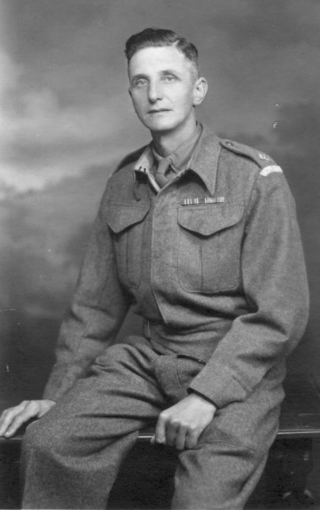 After leaving the army, in 1922 he went to work for the Great Northern Railway, and went on to work for the LNER and British Railways for more than 40 years. The records show that in 1925, aged 27, he joined the National Union of Railway Workers (NUR) at its Derby (9) Branch. He married Rhoda Phyllis Summerby in 1929. In 1931, the electoral roll records Edgar and Rhoda together with George and Constance Mary Culpin T an address on Market St. He was a member of the Church Council and the local branch of the British Legion. He was at one time captain of the Bottesford bowls team, and was also the secretary of Bottesford Friendly Society. In 1924 he became a member of the church choir and was a chorister for 56 years. His army service resumed during WW2, when he was appointed a Lieutenant with the 5th Leicester (Belvoir) Battalion of the Home Guard. In 1971 he had a “dice with death” while on duty as a ‘lollipop man’ in Market Street, by the Market Cross. He had been a School Crossing patrol there for more than 7 years but retired later that year, in November of 1971, when he was 74. During his later years, he lived at 19 Market Street, in the cottages at the back of the White House. In October 1979, he and Rhoda celebrated their Golden Wedding Anniversary, when he was aged 82 and Rhoda was aged 78. He died in October, 1979, aged 82, in Newark Hospital. Rhoda died in 1994, aged 93. Cecil Culpin (born in 1899, at Coleby, Lincolnshire, baptised 21st May 1899 at Bottesford parish church) was the younger brother of Edgar Culpin. There is a Medal Index Card for a ‘Cecil E Culpin’, 4375, then 891253, Driver, Royal Field Artillery. However, this refers to Cecil Edward Culpin, who lived at least until 1930. Electoral records indicate that he lived near Peterborough, with Annie Culpin, William Rimmington Culpin and Sydney Rimmington Culpin. We can be confident that this MIC does not refer to the Cecil Culpin who came from Bottesford. No other military records for Cecil Culpin from Bottesford have been found. Bearing in mind that he was not 18 until late in 1917, it is likely that he was still in training when the war ended, or he may not have enlisted at all. He married Winifred Stirland in 1922, at Ilkeston, Derbyshire. However, their life together was cut short when he died in 1924, in Nottinghamshire, aged only 24.